It was a busy week in the world of Nintendo, with two announcements standing out above all others and a couple of corking eShop releases that were reviewed. As is now tradition we've decided to make life easy for you if you're trying to keep up, collating the best news of the week as well as all of the releases and reviews you've come to expect of Nintendo Life Weekly. This week we talk about the upcoming Super Smash Bros. Direct, or 'Final Video Presentation' if you prefer, Minecraft: Wii U Edition and more besides. Does the thought of missing one of our videos make you feel sick in the gut? The only remedy is to subscribe to our YouTube channel of course! Wait, "Final" Smash Bros direct? Are they going to be totally done now? Sadness! Well I'm still looking forward to Metroid Federation Force. (no sarcasm at all, seriously it looks like a good time) I do hope they continue to support Smash Bros, but with the NX around the corner they might be already gearing up for the next one. I doubt it, but anything is possible. Gonna miss the Smash content announcements for sure. The last couple of years have been a ton of fun. Hopefully they go out with a bang. Dang it, it was "just" the weekly recap. Seeing anything related to Smash prior to the Smash Direct proper is bound to make my heart race. Does two and a half years of being drip fed trailers really constitute an era? It seems a bit hyperbolic to me. Also they better announce Snake or I'm sneaking into Nintendo HQ in a cardboard box and giving Sakurai a wedgie. I need a Snake amiibo. Did you hear @Mega719? We have another 200 comment-worthy article on our hands! Everyone is so ready to move on when everything is still so fresh. What a disappointing crowd. @Mega719 I saw that too, that Rare Replay could be ported to Wii U. All I can say is "Day 1 Purchase" for me if it happens. @Mega719 Please don't say that. You will set me up for inevitable disappointment when it's inevitably proven it won't be happening. But it'd be nice if it did. @chiefeagle02 Rare replay on Wii U would be a day one buy for me too! @Azikira I like the look of Federation Force too but I'm worried I won't have anyone online to play with. Especially after seeing the sales of Triforce Heroes which was a Zelda spin off. Alex made me laugh at 1:40, seeing his face playing Nintendo Land. @wazlon Sadly I can't play online games with my net, and have no local friends so I'm hoping M:FF will have some hearty single player content. Fast racing neo is amazing!!! @Azikira With the NX just on the horizon, this looks to be it. 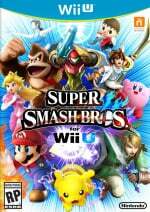 Sakurai and Co. are going to begin planning the next iteration of the Smash franchise. Rare Replay would be sweet on Wii U, could really push some sytems, but M$ said it was up to Rare. @Azikira I'm not sure there will be a lot of people to play online with anyway so I'm hoping it will have a good single player too. @Greshdon Why don't Nintendo just buy Rare already! Seriously, have Rare actually created any decent games for a Microsoft system? In ahort, acquisition isn't that simple. It has to go through severl government offices, and being three nations would be involved, that would be a lot of proverbial red tape. As for games, I haven't tried Grabbed by the Ghoulies yet, I rather enjoyed the Viva Piñata games as well as Kameo and many of the arcade games. The other X360 exclusive games, well let's just say you didn't miss much if you never played them.